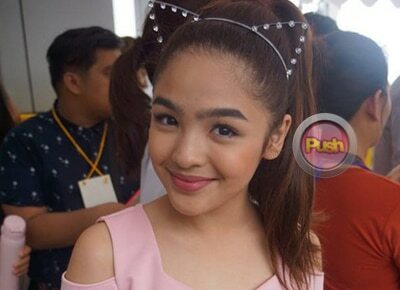 Will Andrea Brillantes record her own album soon? Andrea Brillantes reveals what her new single, Happy To Be Me’ means. Child star Andrea Brillantes seems to be trying a new career path in singing as she launches her new single, “Happy To Be Me” under Star Music. “Noong una, nalaman ko lang na parang kukunin ako ng Star Music… Tapos biglang magkakaroon daw ako ng song, ng single na ‘Happy To Be Me’ so super happy ako ‘dun and I’m super happy to be me,” she recalled, telling PUSH.com.ph about how she learned of this new endeavor. Does this mean that she will eventually record her own album? “I don’t know pero kung maging successful, baka maybe. Sana,” she said, also hoping that her song will have a follow-up. Meanwhile, Andrea is busy working on her YouTube channel. According to her, she has uploaded content requested by fans. “Lalo na ‘yung sa room tour, ‘yung sa Musical.ly tutorial, kasi siyempre dapat binibigay ko rin ‘yung mga gusto ng mga fans ko para rin mapasaya sila,” she said.